I love a good subscription box. Nothing quite beats the idea of having a box of surprise goodies delivered to your door on a monthly basis, does it? 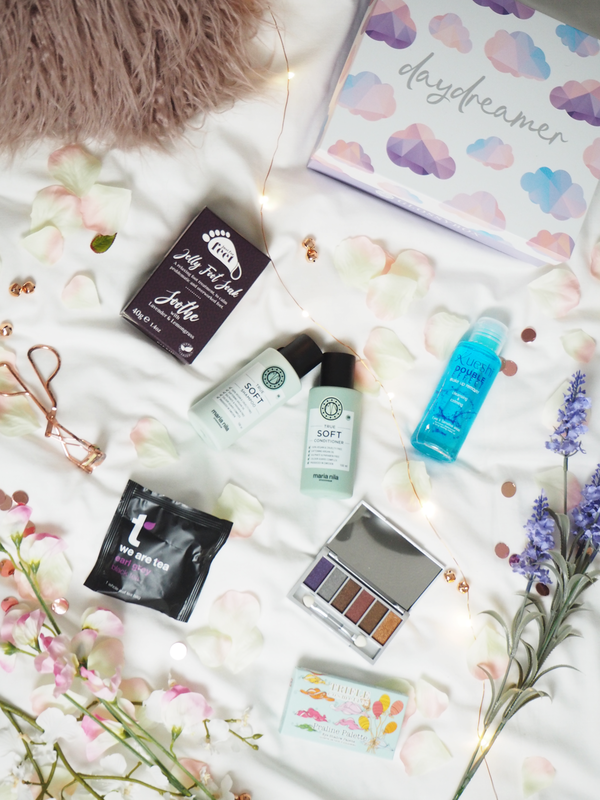 One of my favourite subscription boxes and one I hear come up time and time again is Glossybox. 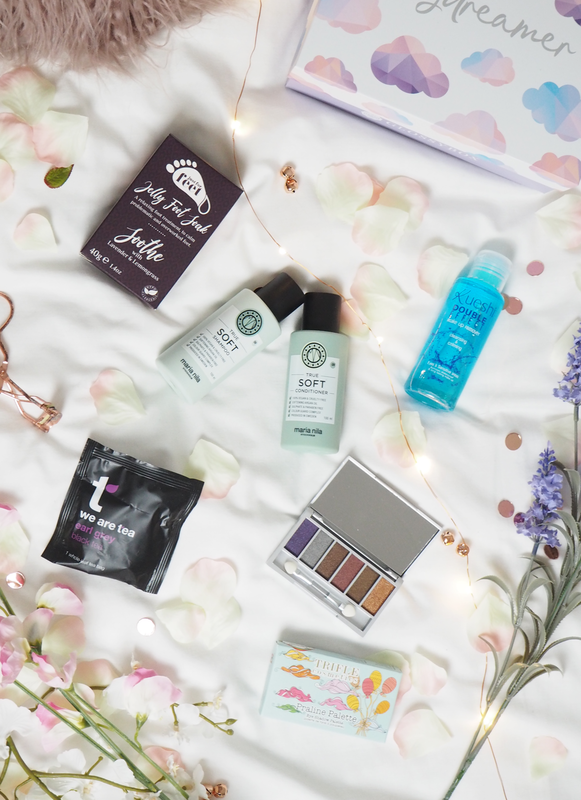 I was lucky enough to receive the May Glossybox this month, and I’m so excited to share with you what products came inside this month! The design of the May box has got to be my favourite I’ve seen, it’s ‘inspired by tranquil settings and is designed using a palette of soft, pastel hues. It’s purposefully curated to help you to relax and dream about your aspirations for the future.’ How cute is that? The Maria Nila True Soft Shampoo and Conditioner Set sound amazing. True soft is based on argan oil, which moisturiseses and revitalises dry and brittle hair. I’m saving these two little mini’s for my trip to Prague in a couple of weeks but I already know my hair is going to love them! If you know me, you know I love my tea! I got an Earl Grey teabag from We Are Tea to give a try. Perfect for sipping on while I work towards those dreams! Another product I’m waiting to use when I head off to Prague is the Kueshi Double Effect Makeup Remover. Combining a gentle lotion with an oil-rich fluid, it claims to be a gentle eye makeup remover especially for long-lasting makeup, that leaves no greasy residue after using. Sounds right up my street! Now the product I’m most excited about is the Just for Feet Jelly Soak. The Soak helps to revive your feet, allowing you to concentrate on soothing them and ensuring they’re in top shape. Who doesn’t love a good pamper?! The sample I got has Lavender and Lemongrass scents for that extra relaxation. And let’s be honest, who isn’t excited by the concept of a jelly soak?! The last product I got was the Praline Eyeshadow palette. This is a super cute handy palette which I can see perfect for keeping in a handbag. For me, the first two shades – a sparkly purple and sparkly grey/silver aren’t my usual picks, but the latter half of the palette is full of orange and browns, which are much more my style. On an initial swatch, the colours looked great so I look forward to creating some looks with this! If you fancy your own Glossybox, you can get 15% off with the code ‘LUCY15’ at checkout, valid until the end of this month. *This post contains gifted items. This post contains affiliate links. "Becoming a shower over bath girl with Lush?" "5 Cost Effective Guest Room Décor Ideas"